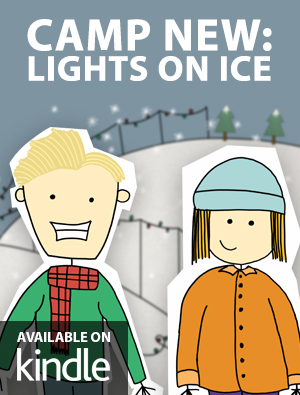 Camp New: Lights on Ice, is a hilarious and adventure filled Christmas book for families! Follow all your favorite Camp New characters, as they learn what Christmas is all about! Archer Ace, the camp’s prideful plum, has another important lesson of humility to learn. He challenges Penny to a last minute ice-skating race down the camp’s biggest hill! How will Penny overcome the dramatic obstacle of ruining Christmas? It’s clear all the coordinators have a big lesson to learn! You and your kids will love the quirky illustrations in this fun-filled story that teaches what a gift Christmas truly is, when it’s spent together.